Solid wood pine construction offers strength and style to this entertainment center with a large TV stand. Rough sawn distressing and a waxy grayish brown finish offer rustic styling, while contemporary hardware knobs add a crisp and sophisticated finishing touch. Adding functionality to the TV stand is a large integrated audio Bluetooth speaker. The included Bluetooth speaker is sized to fit perfectly in the TV stand. It features Dolby digital sound, wireless Bluetooth playback (4.1 + EDR, A2DP standard). It has a bright LED front display (through cloth), four preset sound mode choices, bass and treble control, and a power DC adapter, and inputs in back. A multifunction, 15 key remote control w/ battery included for the speaker. The side piers each have two glass framed adjustable shelves at the top with an additional shelf within the door. The Townser Entertainment Center w/ Large Bluetooth Speaker by Signature Design by Ashley at AHFA in the area. Product availability may vary. Contact us for the most current availability on this product. W636-34 Right Pier 1 28.25" 14.75" 76.13"
W636-35 Bridge 1 75.75" 13.13" 2.5"
W636-33 Left Pier 1 28.25" 14.75" 76.13"
W636-30+W100-41 Large TV Stand w/ Large Bluetooth Speaker 1 62" 20" 35.75"
Storage Drawer interior (2) 12.88" x 14.63" x 3.50". Door opening (2) 14.75" x 17.25" x 19.75". Top center opening 22.88" x 18.00" x 5.13". Bottom center opening 22.88" x 16.63" x 0.88". 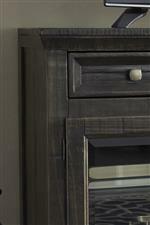 The Townser collection is a great option if you are looking for Rustic Contemporary furniture in the area. Browse other items in the Townser collection from AHFA in the area.